Windsor, NC Bojangles'® Tands, Inc. Store #40 - Bojangles'® / Tands, Inc.
Bojangles’® in Windsor, NC: It’s Bo Time! When you’re craving some down-home food, nothing satisfies like Bojangles’® in Windsor. NC. For tasty, crispy fried chicken, flavorful southern-style sides and fresh flaky buttermilk biscuits in Windsor, NC, it’s Bo Time! Bojangles’® opens early to feed our customers and has great options for breakfast, lunch and dinner. The Windsor Bojangles’® is located on Carson Alley near the new Hwy 17 bypass. Bojangles’® is the perfect spot to have lunch while visiting the Windsor historic downtown. 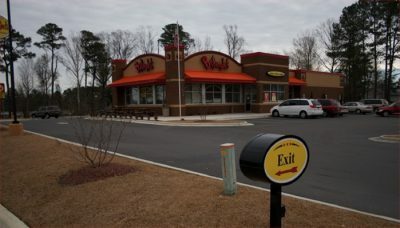 Bojangles’® also provides event catering in the areas surrounding Windsor, NC!